Raz El Hanout is a North African spice mix usually rubbed into meats like Lamb and Chicken then fiercely grilled on flame – totally fantastic, blow ya sideways!! You can buy this in jars which is fine but if you happen to have an extensive spice library then make your own – this really is spice alchemy. This can be served hot or cold but if you’re going cold then bump up the spices and seasonings as they diminish when food cools. Bung everything here into a spice grinder or get angry with the Mortar and Pestle until you have a fine spice powder – there’s your Raz El Hanout. As mentioned Lamb and Chicken are the preferred meats for this but you can use it on robust fish like Salmon. On this dish I’ve used skinned and boned chicken thigh, just simply coated in olive oil then generously covered with the Raz El Haout and left in the fridge over night. Because this is a dry spice rub it works best if you grill or Bar B Q the meat at high heats, the oils in the meat mix with the rapidly caramelising spices – bloody brilliant! 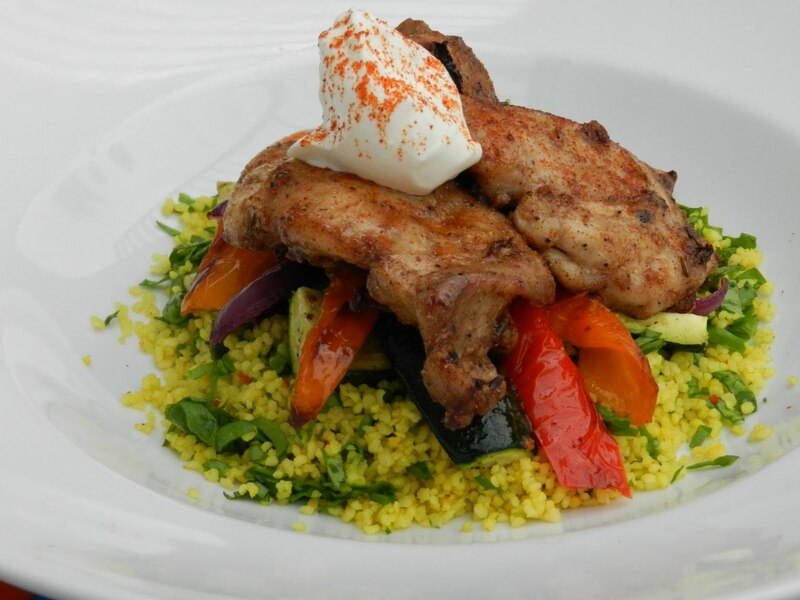 Serve what ever meat you choose with spiced Cous Cous, grilled peppers and Aubergine -a big dode of yogurt is a must with this by the way! PS – if you can get your hands on goat then use that, hard to get, very under rated but better than lamb or chicken…..just in case a passing goat sales man knock on your door!